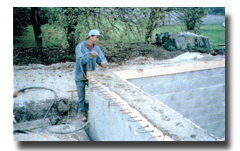 Briefly what is involved in building a Concrete Render and Tile Swimming Pool. The pool is laid out and excavated. 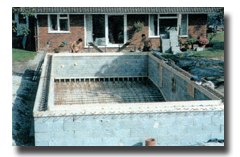 The bottom of the pool is covered in 75mm of 50mm clean gravel. 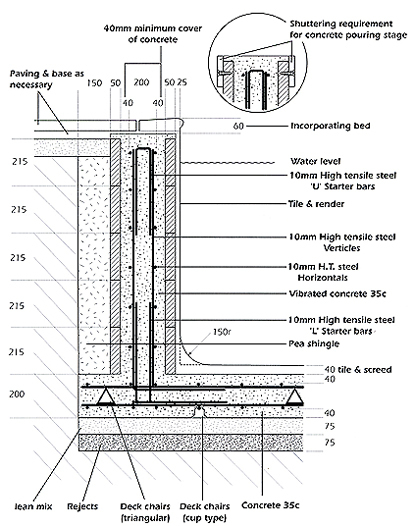 and a layer of lean mix concrete is laid over the entire base area 75mm thick. 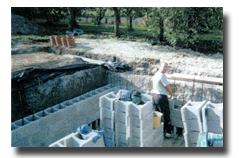 Using the Clearwater special blocks, called E blocks, the first layer of blocks are laid. 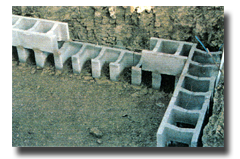 The walls are built up using Clearwater Special blocks and the reinforced steel added. 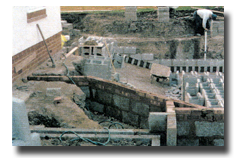 As the walls are built up the pool fittings are added such as return inlet and surface skimmers and underwater lights. Once the walls are built up to the required height back filling with pea shingle can commence. 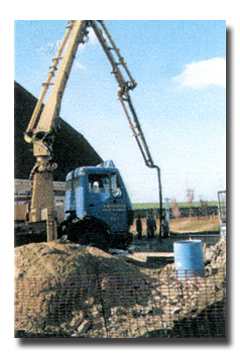 The steelwork is laid to the required shape in the walls and for the floor. Backfilling can now commence but only taken up to the bottom of the pipes. The rest of the pipework should now be fitted and plumbed back to the filter house, along with any electrical requirements. 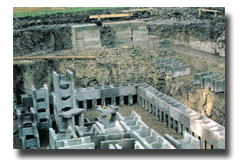 Backfilling can then be completed. 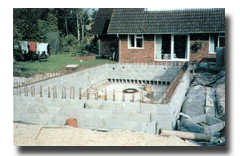 Once all the steel work and pipework is in position, the concrete can be pored for the walls and floor, if you are using a pump you must ask for a pump mix. 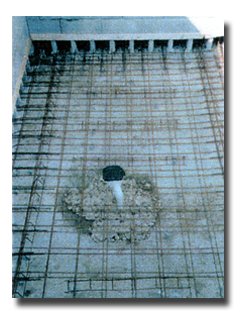 The concrete should be vibrated and tamped into position to create a dense structure with no air pockets. 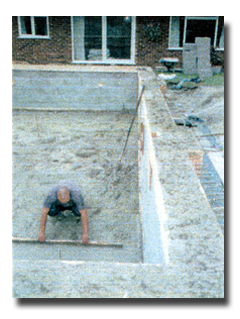 This tamping should be carried out as accurately as possible, as a good result will help when applying the pool finished/tiling. 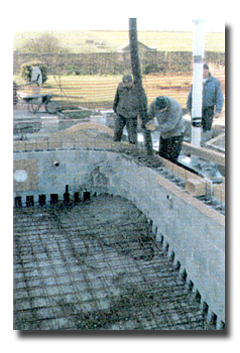 Next the copings must be cemented around the pool so that the walls can be rendered up to them. 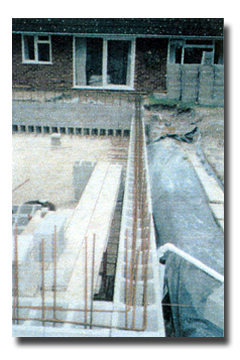 The copings should protrude 25mm over the inside of the pool wall to allow for the rendering and mosaic. 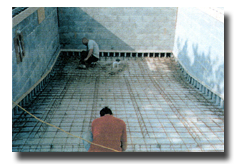 Take particular care to make the coping perfect as this is one of the most important operations of the pool construction. 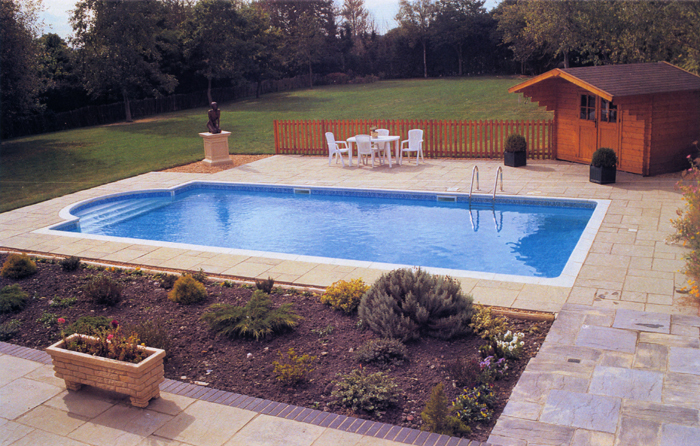 Clearwater Swimming Pools have a full range of tiles for the internal surface of the swimming pool.